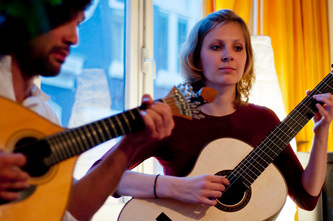 The AMSTERDAM FADO FEST is a joint venture of Theatre Munganga and Rafael Fraga. 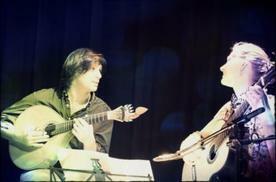 Fado Inverso is the new project of singer Ana Roque and guitarist João David Almeida. By subtly mixing the Fado tradition with other influences, they present a refreshing approach on some of the most important songs of the Portuguese Fado repertoire. Ana Roque is an emerging voice in the new Fado generation, featuring a distinct voice and a very personal approach on traditional Fado. João David is an accomplished guitarist with a diversified background, ranging from worldmusic to Jazz. In FADO OF MEN Rafael will interpret a unique selection of essential Fados formerly sang by historic male singers, such as Carlos do Carmo or Marceneiro. 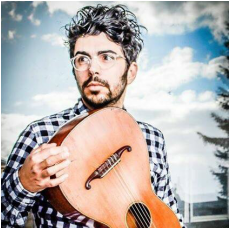 This repertoire, mostly unknown to the international audience, will also Portuguese guitar compositions and Rafael’s own original material – anticipating the release of his new album “Trova Caminhada”. Rafael is an Amsterdam-based composer, guitarist and singer, known for is highly personal interpretations, sophisticated harmonies and innovative projects. A Place to Belong is Kim de Stella's first album, comprising her own compositions along with covers from Bon Iver and Randy Newman. Rafael / Fado meets bossanova will take the stage of the Summertime Festival on Friday July 14, for a cheerful, surprising and groovy mix of Portuguese, Brazilian and other grooves. Following a collaboration in 2011, Rafael was once more invited to write music for the latest program of the Nederlands Blazers Ensemble, dedicated to Cuban music. The project toured the Netherlands in January 2016 and counted with the participation of Cuban artists such as Pancho Amat and Yusa. The cozy and intimate atmosphere of the Fado clubs of Lisbon recreated in Amsterdam, in a series of regular concerts at Munganga Theater, which I have the pleasure of hosting. The concerts take place in an informal setting, inviting the audience to participate and getting involved. tour concert in Wroclaw, Poland. New composition for cello and portuguese guitar, inspired in the works of visual artist Isolino Vaz. Commissioned by his daughter, cellist Isabel Vaz, as part of the celebration of her late father's 90th anniversary. 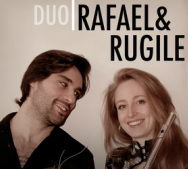 Rafael and Lisbon-based singer Ana Roque started to work on a new CD. The first recording sessions took place in Lisbon and the album will consist entirely of yet unreleased songs by Rafael. Rafael invites fado singer Ana Roque for a joint venture in an upcoming album. Rafael's totally original and unreleased songs will inspire the search for a unique space, blending fado influences, bossanova and deeply rooted in Portuguese folk traditions. Newly composed original soundtrack by Rafael Fraga commissioned for the second episode of Blues in Boxes, a series of short stories by Anna van der Kruis. Live performances from Aug 1 to 11, Boulevard Festival (Den Bosch). 20 Canções para Zeca Afonso is a set of songs by José Afonso which I arranged. It's a blend of folk, jazz and classical contemporary music, written for two singers, piano and saxophone jazz quintet and string quartet. From 2012 onwards I rearranged some of the material in order to allow a smaller stage setting without strings and saxophone. With: João Paulo Esteves da Silva, Jorge Reis, Sofia Vitória, João David Almeida, Augusto Macedo, etc. 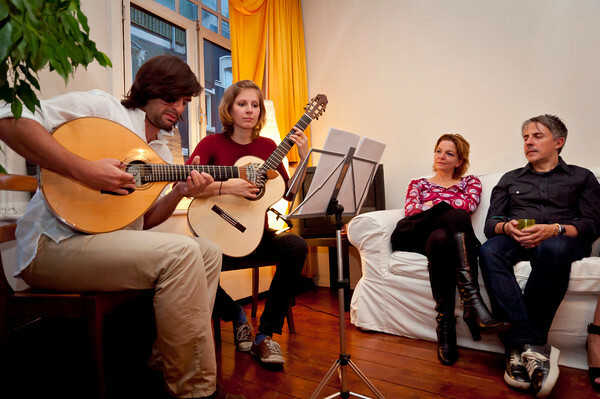 In 2011, the Nederlands Blazers Ensemble dedicated a program to Portuguese music. I was honored to be invited as artistic consultant, arranger and guest composer. With fadista Ana Moura and portuguese guitarist Bernardo Couto. 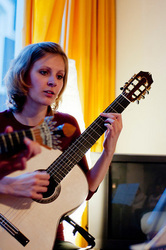 Guitarra e Mistério is a project centred on the portuguese guitar and some of its classic repertoire, along with new arrangements and adaptations. Music by Rafael Fraga, Carlos Paredes, António Pinho Vargas, Charlie Haden, Jobim and others. Composer / arranger | Nylon guitar, electric guitar, portuguese guitar and vocals. Rafael was born in Lisbon and lived in the Azores (Portugal) most of his childhood. He started playing the guitar at the age of 13 and after concluding a BA in Biology he dedicated himself entirely to music and writing. His main musical influences are Bossanova, Portuguese folk music, Jazz and classical-contemporary music. His work an composer and arranger reflects a need to blend these diverse musical contexts and perspectives in a balanced way. He has worked as a guitarist, composer and orchestrator in many projects. 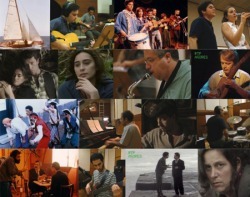 Some of his most relevant collaborations include leading fado singers such as Carlos do Carmo and Ana Moura, poet Nuno Júdice, pianist João Paulo Esteves da Silva or the editor Nelson de Matos (Portugal), the Nederlands Blazers Ensemble, Quatro Ventos, Daisy Correia (Netherlands), along with many other artists and ensembles. Besides music, he writes prose and poetry, with sparse publications. He has released and participated in several music albums and edited two songbooks, with Augusto Macedo as co-author. Rafael is currently based in Amsterdam. Eira | Piece for soprano, portuguese guitar and ensemble - recorded July 2011, unreleased. With João Paulo Esteves da Silva, Augusto Macedo, João David Almeida, Alexandra Ávila, etc. New project with Rafael Fraga and the Lithuanian singer Rugile Daujotaite, presenting a unique selection of original music, folk and Brazilian/jazz. Dutch-Portuguese singer Daisy Correia recently started her new tour, dedicated to the music of José Afonso. In about 20 concerts, we are exploring the work of this wonderful author throughout stages allover the Netherlands. A unique blend of Portuguese and Lithuanian folk songs, Bossanova and Jazz. 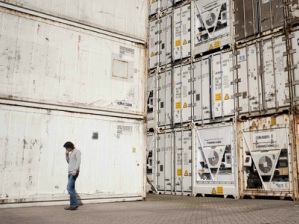 A closed container, 15 refugees totally in the dark trying to preserve their sanity and communicate. Text and direction by Caitlin van der Maas, music by Rafael Fraga. With Yentl Schieman and Rafael Fraga. Rafael's first original project, active from 1999 to 2004, deeply influenced by Brazilian music. Live recorded and released in 2003. With: Rafael Fraga, Alexandra Ávila, Paulo Andrade, Augusto Macedo, Pedro Agrelos and Carla Cordeiro. Media type: Live recorded album. _ Melissa Oliveira's new project is a blend of jazz with Portuguese music. Rafael was invited to bring the Portuguese guitar particular touch and sonority. Rota del Sud is a jam session dedicated to the music of Latin and Mediterranean cultures. 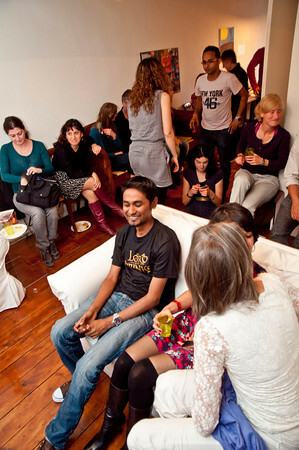 A gathering of musicians and music lovers who share their passion for the warm music of Brazil, Mexico, Portugal, etc. Rafael's project dedicated to the Portuguese guitar goes live in Amsterdam, for a private venue. With Eva Aukes (g). Portuguese composer, guitarist and writer. 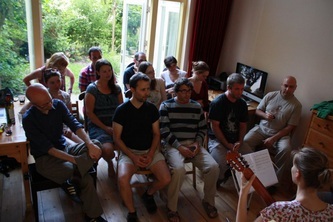 The final concerts for this season's free guitar lessons group is now officially scheduled for December 9th, at 20h in Talia: stress, surprising songs and exciting performances! Special guests: Otto Cepella (gt) and Aili Deiwiks. For more information, check the Free guitar lessons webpage. The Nederlands Blazers Ensemble presents a program fully dedicated to Portuguese music. With acclaimed fado singer Ana Moura and guitarist Bernardo Couto. 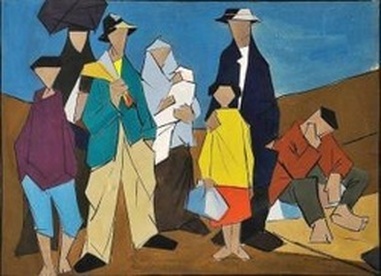 The music is composed and arranged by Rafael Fraga, Luís Soldado, Guillermo Lago, among others, and recalls also late composers such as Zeca Afonso, Júlio de Sousa or Artur Paredes. Rafael Fraga contributed with Lamento, a piece premiered in 2010 and arrangements of Se voaras mais ao perto (Zeca Afonso), Fado das águas (Mário Raínho/Alfredo Marceneiro), Fado vestido de fado (Fernando Maurício, Mário Raínho / Trad.) and Aguarda-te ao chegar (Carlos Viana/ Cristina Viana). > Radio 4 Live broadcast available here! > Live concert sound samples here! Azorean singer and songwriter José Medeiros has recently released his latest record, Fado, Fantasmas e Folias (Fado, ghosts and revelries), in a double album in which Rafael had the pleasure to participate: he arranged and recorded Portuguese and acoustic guitars in Santiago, Campo d'Estrelas (Santiago, Fields of Stars), sung by José Medeiros and Galician singer Uxia. Rafael's music is now also available at Bandcamp.com, an online service for music distribution. You can check Rafael's Bandcamp page and download Entre cidades from there in all required formats, from Wav, FLAC, Mp3, etc. Rafael participated with Guitarra e Mistério in the Dias Latinos, a festival fully dedicated to Latin rooted music. 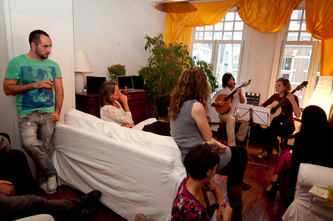 In two presentation of 45 minutes, the Portuguese guitar brought some unique atmospheres and emotions to this event. Soon there will be media and new features regarding the première of Guitarra e Mistério. Stay tuned! In Guitarra e Mistério, Rafael's new project, the Portuguese guitar explores new and fascinating musical paths and reveals what’s beyond Fado in Portuguese music. 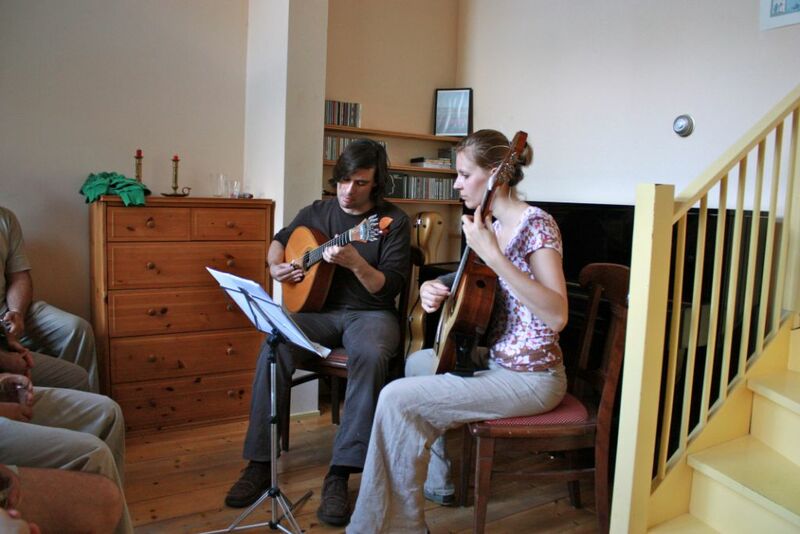 This première will present the duo developed with guitarist Eva Aukes in a journey through some of the best Portuguese folk inspired music, paying also a unique tribute to other traditions and musicians, such as Jobim or Pat Metheny. For the second time Emanuel Pessanha invited Rafael Fraga to share the informal and cosy stage of Oporto - Casa de Fado at Nijmegen, the Netherlands. A good opportunity to share a quiet Sunday afternoon in the company of fado and the Portuguese guitar. Project dedicated to Azorean music, produced by the Teatro Micaelense. Following the edition of the Azorean Authors Songbook and the live concert dedicated to this music in 2007, now comes the edition of the CD, which Rafael directed, and a DVD containing a documentary directed by José Medeiros. 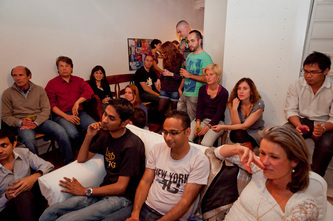 The public presentation of both works occurred December 2010. With: Alexandra Ávila, João David Almeida, João Paulo Esteves da Silva, Jorge Reis, Bruno Pedroso, among others. 2009 marked the bicentenary of Charles Darwin's birth (12 February 1809) and the 150th anniversary of the publication of his groundbreaking On the Origin of Species (24 November 1859). The University of Porto CETAPS held a special conference to honor Charles Darwin's enduring legacy, and examine how his ideas remain central to contemporary research, within and beyond the biological sciences, echoing the global celebrations of his life and work, and his impact across the disciplines. Rafael presented On the Evolution of Musical Species, a paper applying Darwin's theory to the history of classical music.